SUPER TWO DOUBLE BEDROOM SPACIOUS MEWS HOUSE ON THE POPULAR STAMFORD BROOK estate located close to the local motorway networks and less than 5 minutes drive to Altrincham Town centre. Comprises of : - Front lawn and path. Entrance hall with study area or storage; downstairs WC / cloakroom. Off the hall a modern fully fitted kitchen with oven, hob and appliances. Light and airy Living room / dining room with french doors that open onto the rear enclosed lawned garden. Upstairs there is a Master Bedroom with double fitted wardrobes recently updated en suite shower room and second double bedroom with fitted double wardrobe. wooden windows ,GCH and a main bathroom with bath, Sink and WC. EPC Rated C. Allocated parking space. 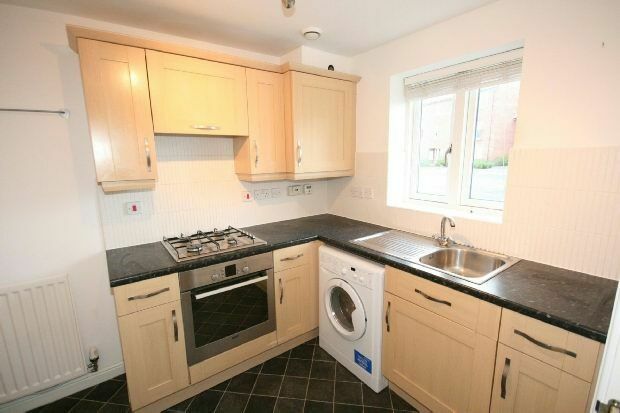 Wooden door through to kitchen with a range of wall and base units, stainless steel sink, integrated gas hob, electric oven, extractor fan , washing machine, fridge/freezer. wooden window, radiator and spotlights to the ceiling. Wooden door into Downstairs WC with vinyl flooring with toilet, sink part tiled splashback. Wooden door to en suite recently refurbished shower room comprising shower cubicle, wc, sink. radiator with vinyl flooring, shaving point and wooden window. Paved area from the patio with path to wooden back gate, fencing to all borders and some shrubs, and lawn area.